Sheet acrylic profile, DIY electronics with Arduino including various sensors, hardware and open source code, Sugru, CO2 tank and full apparatus (tank regulator, tubing, flow regulator), DIY bioreactor with flask and peristaltic pumps, biotextiles on scaffolding with live connective tissue in vitro, cell culture media, various found materials. Includes live feed microscopic digital video and monitor display. Includes hand-built, recycled wood workbench designed and constructed by Carlos Jabbour. Incubatrix Neith is a functional electronic laboratory appliance set (incubator + bioreactor). Both incubator and bioreactor are apparatuses for maintaining the viability of the biotextile held within, operating as a complete support system that provides the necessary atmospheric and physical conditions for mammalian cellular ‘life’. Those conditions include a stable (body) temperature of 37&#730;C, 5% CO2 to buffer the pH levels of fluids, purified nutrients, preventative antibiotics, low light, humidity and all of the infrastructural electronic signaling that adjusts any variable in order to maintain the required equilibrium. The peristaltic pump system, which feeds nutrients in and siphons waste materials out, is a biomimesis of the functioning of the gastrointestinal system (peristalsis). The title of the work references the Egyptian goddess, Neith, who weaves the matrix of reality each day. She is a parthenogenetic maternal deity of creation and re-creation. Another version of her name, Net, directly connotes textile methods and objects, as well as the more contemporary reference to digital technology. The hieroglyph of her name includes the symbol of a loom. Naming the appliance in this way mimics industrial mechanism branding, where old world deities or archaic language representing the celestial are used to denote the superhuman powers of technology that enhance human life (e.g. Zenith, Nike, Electra, Eos, Nova, Apollo, etc). Incubatrix Neith contains Biotextile n=x, a vital textile created with a mash-up of low-tech traditional methods and high-tech materials/ methods. The loom used to create the biotextile was 3D-printed in miniature scale at the Pelling Lab, using polylactic acid (PLA), a cell-friendly, biodegradable thermoplastic derived from plant starch, and which promotes tissue growth. However, the loom design itself, an open source design file found on Thingiverse, is that of a traditional, basic frame loom that children often use to learn to weave. The woven material on the loom is structurally a plain weave, the most fundamental woven structure. 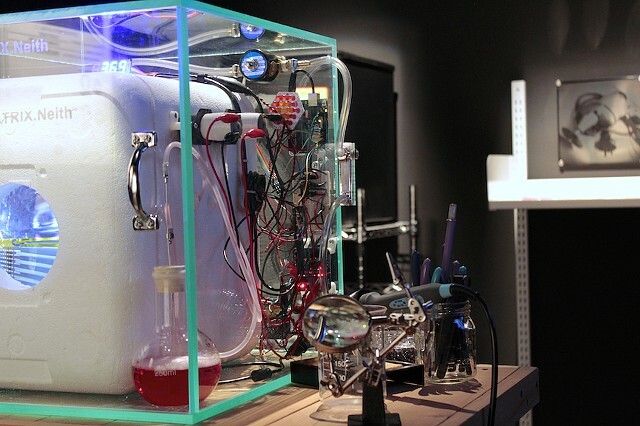 Biotextile n=x is a constructed human/nonhuman microbiological system growing in response to and protected by its managed environment—managed by both the automated vessel, Incubatrix Neith and the artist/ gallery staff/ collaborators. In addition to this, Biotextile n=x ignores conventional scientific research rules. Normally, a researcher must not work with self-sourced bodily materials in order to avoid possible self-contamination via bio-matter that is familiar enough to bypass immune response. This particular weaving is done with the artist's own hair, which initially does not pose a threat tbecause it is considered ‘dead’ matter, but this life/death material boundary is now blurred as it has been activated by nonhuman cell forms that have taken it over and integrated it into their own ‘bodies’. Its zoonotic potential is unknown. It’s ritualistic potential is contagion magic. Finally, Incubatrix Neith is a biohazard containment strategy. Its promise is to prevent leakiness of wet bodily materials. As an electronic ‘body’ for sterile containment of risky ‘live’ forms, Incubatrix Neith must not leak. Mixed media, see description below. 38.5cm x 40cm x 41cm, contained incubator unit only, not including CO2 apparatus. 46cm x 84cm x 91cm, workbench only.